Glasgow introduced a code of conduct in 2010 for marchers including the Loyal Orders. Disputes over parades are putting police under pressure and fuelling sectarian divisions – but can a political route be plotted out of the crisis? In the final of a series of special reports on controversial marches, The Detail’s Steven McCaffery finds that some bold solutions are being considered. RADICAL proposals to see parades in Northern Ireland managed within the same tough framework used in Scotland have emerged as politicians seek to avoid yet another violent marching season. The Detail understands that early discussions have also raised the possible creation of an `interim parades commission’ – overhauling the existing body to secure the backing of Stormont parties, if they agree to negotiate a permanent solution. But while talks continue behind the scenes, Sinn Féin has said that if Orangemen continue to refuse to talk to nationalist residents groups, then the so-called `Scottish model’ should be considered. 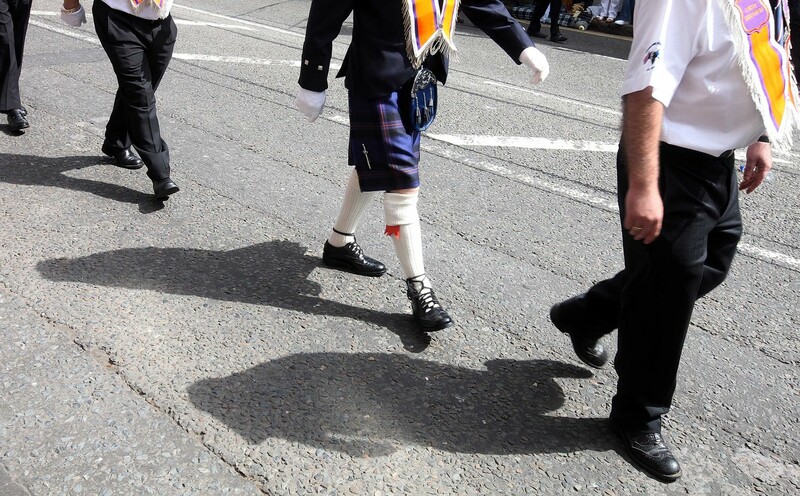 The tough template ensures that parades in Scotland avoid residential areas, bans music near churches, can potentially block marches linked to violence, and has forced negotiations over parades. The number of marches in Glasgow has dropped by 27% since it was introduced. In Northern Ireland senior figures are working with increasing urgency to avoid a repeat of the parades violence that this year cost police £7.4 million and left 92 officers injured. And while the 1990s marked the violent highpoint of the parades crisis, The Detail can also reveal that over the last ten years parades disputes have cost police £53.7million. 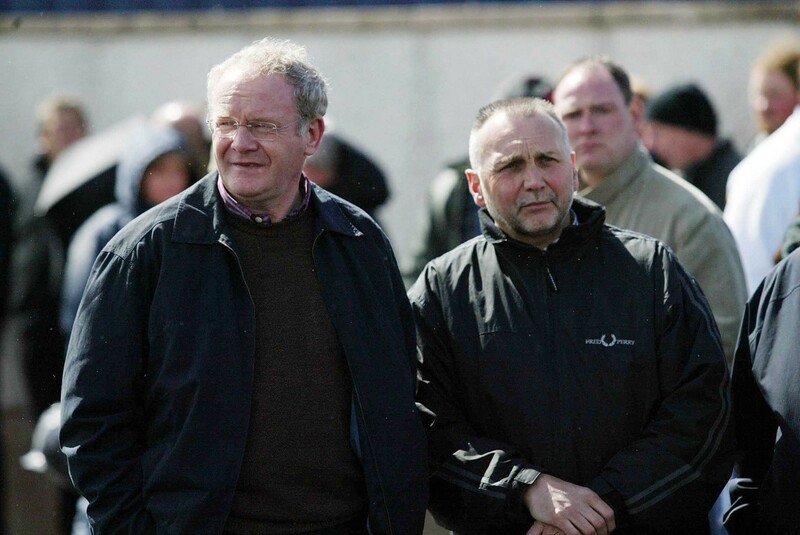 A Sinn Féin team led by deputy First Minister Martin McGuinness will meet the Parades Commission within weeks to call for talks to defuse flashpoint marches, but a senior republican has also said that if marchers refuse to negotiate, the authorities should consider alternatives. Sinn Féin’s spokesman on parades Sean Murray said dialogue could resolve the relatively small number of marches that cause controversy, but said a refusal to discuss outstanding parades could not be overlooked. “Our focus and our priority is in relation to direct dialogue, we want to stress that,” he said. “But if that fails, then we have to look at other options, including the Scottish model. “But it is important to say that our preference is for resolutions through negotiation. Unionist politicians ultimately want to see the end of the Parades Commission. But there’s also an acceptance that the subject needs oversight. The DUP is understood to be taking soundings within its community on the best way forward on parading, and party leader Peter Robinson has already told the Assembly he would like to see agreement on potential discussions before the end of the year. He is likely to address the parades issue at his party conference which is being held on November 23 and 24. Two years ago the Orange Order rejected the alternative system for adjudicating on marches that Mr Robinson negotiated with Sinn Féin at the Hillsborough Castle talks. But now a range of senior political figures are fearful that a gap has opened-up – between marchers’ refusal to deal with the Parades Commission, and the time required to negotiate any alternative. The dilemma is how to bridge that divide, and bolster confidence ahead of the 2013 marching season. Various scenarios are being debated, including the possible creation of an `interim Parades Commission’ – which, if pursued, could see a potential overhaul of the existing organisation with political backing from Stormont – but only if parties are committed to subsequently negotiating a permanent alternative system for overseeing problem parades. The options are being discussed against the background of the fact that, for the first time, all the main political players now officially accept that local dialogue and accommodation is the key to unlocking disputes over marches. Sinn Féin has recently met the Parades Commission to review the outgoing marching season, while the two will meet again within weeks to discuss plans for next year. So far, the police have led calls for urgent talks to hammer-out a blueprint to avoid further conflict, as previously reported here in The Detail. This year’s marching season ended with the revelation that the Orange Order had dropped its long-held ban on talks with nationalist residents’ groups. But a further special report by The Detail led observers to question whether the reform will be enough to remove the logjam. All this comes against the background of figures showing that Loyal Orders hold around 2,500 parades each year in Northern Ireland, with only 5% facing any restriction. But as The Detail also reported, this has not dampened loyalist anger. However, in an era when Ulster-Scots cultural links are high on the agenda, the Loyal Orders may look with concern at how marches are handled in Glasgow. Glasgow holds hundreds of parades each year, with most organised by the Loyal Orders, but a desire to improve management of marches saw the City Council draft a Code of Conduct on Public Processions in 2010.
:: Responsibility for parades, and bands, lies with march organisers who should ensure a “peaceful event, that has as little negative impact as possible on local residents, businesses and communities”. :: Routes for processions are presumed to “avoid residential areas and should, where practical, keep to main arterial routes”. The need for repeated parades, such as multiple feeder marches, are questioned. Requests for city centre marches are measured against special criteria, as the council endeavours to balance the rights of marchers with the needs of retailers. Evidence that parades have hit city centre trade has fuelled recent calls for tougher legislation. :: Music cannot be played by marchers before 9am or after 6pm, though reforms could see the deadline extended to 8pm in special circumstances. Music must stop when approaching and passing a place of worship “irrespective of whether a service is in progress”. This rule could be tightened to ban music, or even a drum beat, within 100 metres of a place of worship. Restrictions can also be placed on music near sensitive areas such as residential developments, football grounds or pubs. :: Disruption should be minimised, with the code aspiring to have marchers walk four-abreast, and processions split into sections to facilitate traffic and pedestrians. A further aim of the code is that “marches of 1,000 participants or those assessed as high risk will be required to assemble in a public park, or equivalent space agreed by the council, and proceed to another park or equivalent space for dispersal…to minimise unnecessary disruption”. :: Violence in the past or the risk of future disorder could see parades effectively banned from contentious areas. Any decision to “prohibit or impose conditions” on a parade is made on the four considerations of “public safety, public order, damage to property, or disruption to the life of the community”. Notifications for parades are measured against their likely impact on police resources. Drunkenness or drug use by marchers is prohibited, as is the carrying of ceremonial weapons without special prior agreement. :: Flags linked to proscribed organisations are banned. And while in Northern Ireland controversy has centred on the appearance of paramilitary flags portrayed as being `historic’, such as republican emblems or 1912 UVF banners, the Glasgow Code bans all flags “which are likely to cause offence”. Glasgow famously reflects Ireland’s sectarian divisions in the allegiances associated with its Rangers and Celtic football clubs. It has also inherited the parading tradition so prominent in Northern Ireland life. It cites parading as part of that rich heritage but points to “challenges”, including the number of marches, the frequency of city centre processions, the impact on commerce, as well as “the increasing costs required to police parades…at a time when pressures on overall public expenditure are increasingly acute”. The sentiments could have been plucked from the words of condemnation uttered by politicians and civic leaders in Belfast at the end of the disturbances that blighted July, August and September, and saw Northern Ireland make international headlines for all the wrong reasons. The code’s key principles include rights to peaceful assembly and freedom of expression as outlined in the European Convention on Human Rights, but also a responsibility not to infringe the entitlements of others. The Glasgow blueprint marked out stringent parameters based on Scottish legislation. Initial fears that the code would spark fierce courtroom battles have not materialised. The code has instead provided a fruitful platform for discussions, helping to ensure deals are hammered-out in talks between groups including marchers, the council and police. Since the measures were put in place in the autumn of 2010, the number of overall marches in Glasgow has fallen by 27%, from 497 in 2009/10 to 362 over the last year. Apprentice Boys parades in the city have dropped from 43 to 26 marches over the same period. Royal Black Institution parades in the city fell from 42 to 37 over the three years. But with most Glasgow marches organised by the Orange Order, its processions have been most heavily affected. Orange parades have dropped by 31%, from 252 in 2009/10, to 172 in the last year. Republican marches dropped from 27 parades to 20 per year. 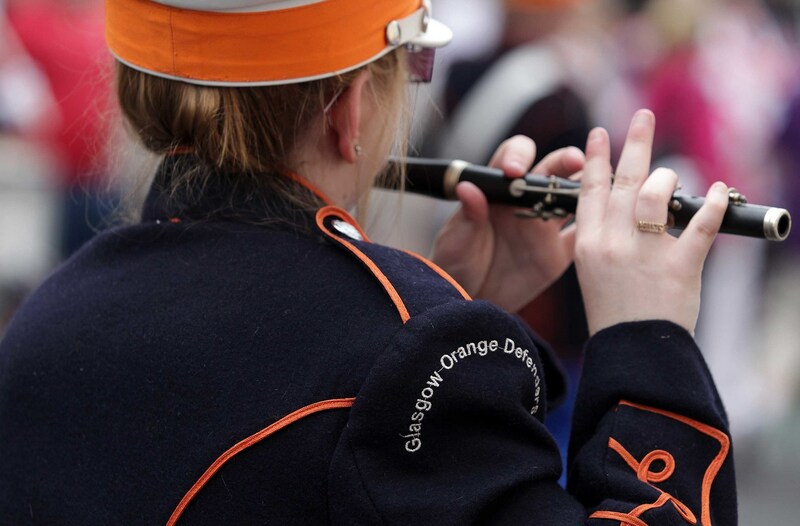 Significantly, police costs for the main Orange Order parade in July in Glasgow dropped from £582,467 in 2009 to £328,092 in 2011 – a saving of over £250,000, or 44%. Arrests at the July parade fell from 55 in 2009 to 32 in 2011, while Fixed Penalty Notices issued by police in Glasgow for offences such as drinking in public places dropped from 271 in 2009 to 152 in 2011. March organisers have also been asked to pay for the costs of hosting parades. This includes costs for safety barriers, toilet provision, bins and clean-up services. There is no current legal obligation to force marchers to pay for policing costs – but there is a proposal that this be discussed with the Scottish government. A further feature of the Glasgow experience is that while many people publicly declare their desire to continue to see large numbers of parades, it is understood that this is not reflected when views are expressed privately through household surveys in the Scottish city. But if the Glasgow framework was ever considered for Northern Ireland, it would be likely to spark opposition from unionists. In Northern Ireland, however, there clearly is growing pressure for political action to end the annual parades disputes which, though small in number, can spark violence that puts lives at risk, severely impacts on police budgets, and sets the image of the place back decades. Police Service of Northern Ireland figures show the cost of policing parades disputes. A total of £53.7 million was spent by police on parades over the last ten years – a figure that does not include the wider financial impact of violence and the damage caused by rioters. In addition, hundreds of officers were injured at disturbances around marches over the same period. Policing costs peaked with a bill of £9.2million in 2005. In July that year 80 police officers were injured when republicans rioted after an Orange march near the nationalist Ardoyne area of north Belfast. The summer of 2005 ended with a decision to reroute the Orange Order’s Whiterock parade away from a section of the nationalist Springfield Road in the west of the city. It sparked some of the most serious rioting seen in Northern Ireland for years, as loyalists targeted police with blast bombs and automatic gunfire, leading officers to return shots. Sinn Féin’s Sean Murray said the financial cost of parades disputes, whether in republican areas or loyalist, was only one aspect of the problem. He said such disturbances displaced police resources that could be deployed to target other crimes. The violence also damages police relations with communities, he maintains. “It is not just the financial cost, it is the social cost of parades disputes to policing that is important,” he said. “We are depriving neighbourhood teams of resources. His message to unionists, who remain suspicious of republican motives around parades, is that the aim was not to undermine their parading culture, but to ensure mutual respect. Murray, one of west Belfast’s best-known republican leaders, is also turning attention to marches in his own community where he wants to see long-standing militaristic regalia removed. He’s fundamentally optimistic that a solution is within reach – if those in charge are ready to respond to what he sees as a growing mood across society for a resolution to the parades issue. Bind us together, Lord: can the DUP woo the Catholic community?